1. You can’t open the windows in a passive house (PH). On the recommendation of the PHI (Passive House Institute) every passive house has windows which can be opened. The technical ventilation system brings fresh air in, so you won’t ever find any stale air in the house, even if you don’t open the windows for an extended period e.g. during cold rainy weather. (That there is a lack of sufficient ventilation in a lot of buildings, even new ones, is the reason why we recommend ventilation systems. Yes, You can open windows! 2. Due to mechanical ventilation there is a draught. 3. A Passive House has no heating. As a rule a passive house needs only a small heating installation, one, which is not longer important and no longer expensive at all. But it isn’t a ‘zero heating energy house’. The remaining energy requirement for heating is so small, however, that it does not hurt – not the wallet and not the environment, it’s less than 10% what existing buildings use in average. Yes, a passive house (as a rule) has heating. 4. A PH is always rather "clumsy". Where does such a statement come from? There are thousands of passive houses in different shapes and sizes: from partial hip roof houses, to those like truncated cylinders and cones, to those in Wankel-piston form. Architectural design is free (well, we do not have anti-gravity, ever) There is a wide variety available. 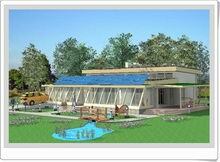 ( Just have a look on the winners of the Passive House Architectural Price). 5. The technology is still in development. A passive house doesn’t require as much technology as a conventional house! The only special technology which is needed is mechanical ventilation with heat recovery, and this has been successfully used in Canada and Scandinavia for more than 50 years. The core of the passive house technology is just very good insulation – tried and tested for a longtime. The roots trace back several centuries – always with very good experience. So why wasn’t it used even more frequently? One answer is just: Cheap oil (at least it was perceived cheap, because we avoided looking at the consequences). And, yes, there is ongoing development, it’s going to be even easier, even better and even cheaper in the future – like we have seen in the development of mobile phones in the decades passed – although phones are cheaper and better now, these have been tried and tested for more than a decade. 6. You can only build a PH on a sunny site. Well, this opinion might be the result of a mix-up with the "passive solar" approach. 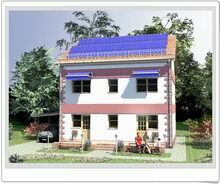 You will find passive houses on inner-city premises with the house facing north. A shaded site is no excuse not to build a passive house. Yes, a sunny site is an advantage. Yes, having windows to the south is very nice. But crucial is only the energy balance. What we use to calculate this balance, is PHPP. And: The designers soon realised, there are a lot of options. One should only try. 7. A PH is much more expensive than a conventional house – it doesn’t pay off. Our last inquiry showed 4 to 8% more investment was required initially – and well experienced architects even have built Passive Houses with no higher construction costs to ordinary contemporary buildings (http://j.mp/reallyCost). You also have to factor in higher financial aid due to the positive environmental nature of the house. The most impressive result comes later: residents will save between 800 and 1500 Euros in running costs every year. If you calculate this over the lifecycle of the house, you will see that you really can’t afford a less efficient house.A special topic within this is the added investment of “thick insulation” – yes, passive houses as a rule in cold climates need quite thick insulation. Now: Insulation turns out to be one of the cheapest tools to save energy, these are very small investments. And the “first cm” pay back extraordinarily well – but even the last ones of a passive house insulation do, because these are still near enough to the very flat optimum and these help to save additional investment costs in the heat distribution system and all systems connected. 8. A PH is always cold. There is only one thing I recommend to do: go and visit a passive house. Inhabitants of passive houses like the warmth; we have measured temperatures between 22 and 24° C in winter. This is affordable, as heating a passive house doesn’t cost a lot; in fact, just some 100 to 200 each year – this is, what others often pay each month. Even if energy prices will skyrocket – paying your heating bill will still be affordable in a passive house. 9. Separate rooms can’t have different temperatures in a PH. That is up to the inhabitants: most users don’t really need cold side rooms, it costs little to keep them warm – so what’s the problem? If you need, there are many solutions depending on what your requirement is (to open a window from time to time is an easy one, of course not the most efficient, but still possible and allowed). A cool sleeping room, a cool wine cellar can both be built into a passive house, if required. Almost anything is possible. 10. You can’t redevelop an old house into a PH. This is generally true, but it’s only half the story: you can build passive house technology into an old building – it takes good exterior insulation, triple glazing and ventilation with heat recovery. You won’t in most cases reach the energy standard of a passive house (with its 15 kWh/(m2a)), but you will get between 20 and 35 kWh/(m²a). Be clear about this though: real passive house redevelopments are possible, even for bigger properties. 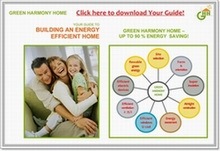 Now there is a certification offered for refurbishment using the Passive House concept: http://j.mp/EnerPHit.